Our practice has continued growing and to continue providing you with the best standard of care, we are welcoming a new Orthodontist, Dr. Kang, to our dental specialty family! Due to an overwhelming need to offer more Orthodontic appointments to our patients, we are opening up 2 full days per week and in the near future we will be opening up a third day as well! Now, let us tell you about Dr. Jinah Kang. She was born in Korea and raised in Rockville, MD. Dr. Kang did her undergraduate studies at University of Maryland at College Park, attended Rutgers University where she received her Master’s degree in Biomedical Sciences and she then earned her Doctor of Dental Medicine (DMD) degree at University of Pennsylvania - School of Dental Medicine. She later received her orthodontic specialty certificate with a concurrent Master’s degree in Oral Biology at Temple University - Kornberg School of Dentistry. Dr. Kang’s love for dentistry stems from her desire to transform the lives of her patients. As a child, she wore traditional metal braces, with the end result elevating her confidence level. It is for this reason Dr. Kang decided to specifically pursue orthodontics. Her ability to help patients achieve the beautiful smile they deserve and to see how happy they feel about themselves makes her life’s calling very rewarding. Dr. Kang attributes her many successes to her parents, John and Linda Kang. Throughout her life they have been her biggest cheerleaders, with her dentistry journey being no different. During her leisure time, Dr. Kang enjoys playing the piano, which she learned to play when she attended Claude Watson for the Arts in her short time living in Toronto, Canada. She also enjoys snuggling up to read a good mystery novel and spending time with her nephew. So when you do come in for your visit, be sure to ask her about her latest mystery adventure! 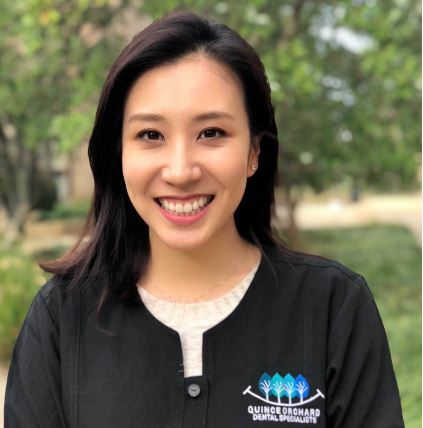 As the newest member of the Quince Orchard family, Dr. Kang has big plans to do her part to keep the practice always reaching for new heights. Our practice is known for its timeliness and attentiveness to each patient and Dr. Kang is a perfect fit when it comes to that. She hopes to provide great care and spend quality time with each and every orthodontic patient, while making their visit as comfortable as possible. With her happy and bubbly personality, we are confident our patients will feel right at home with Dr. Kang. Our new ortho days will be Monday's 8am to 5pm, Tuesday’s 8am-5pm, Saturday’s 8am-1pm, and when we need to open a third day will also likely have Friday appointments available. Also, please note that Pam will be assisting Dr. Kang, along with Stephanie, who comes to us with 11 years of orthodontic assisting experience. Casey, our Office Manager, and our Orthodontic Coordinator, Hilary, are still in the mix to take great care of you and answer any questions you may have. We will also be in network with some dental insurances in the future…so stay tuned and thanks for reading!